Images enlarge with a click; blue text leads to more information with a click. 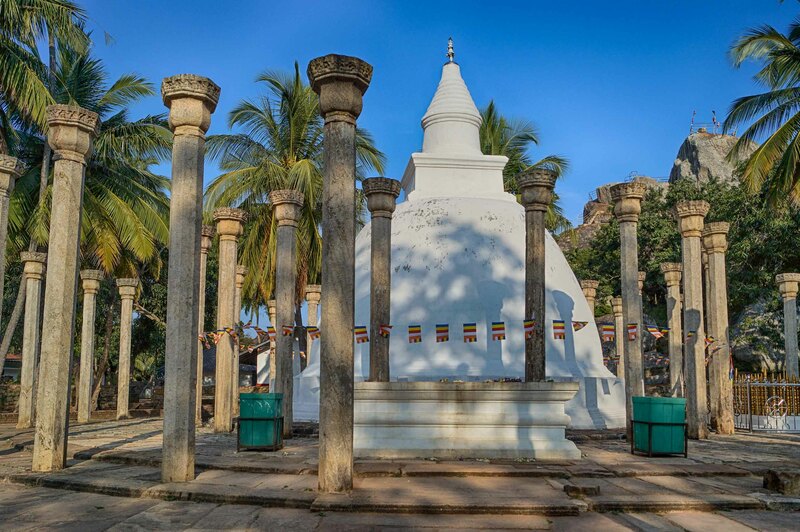 About 13 kilometres east of Anuradhapura we find another significant stop in Sri Lanka’s Sinhalese “Cultural Triangle” area. 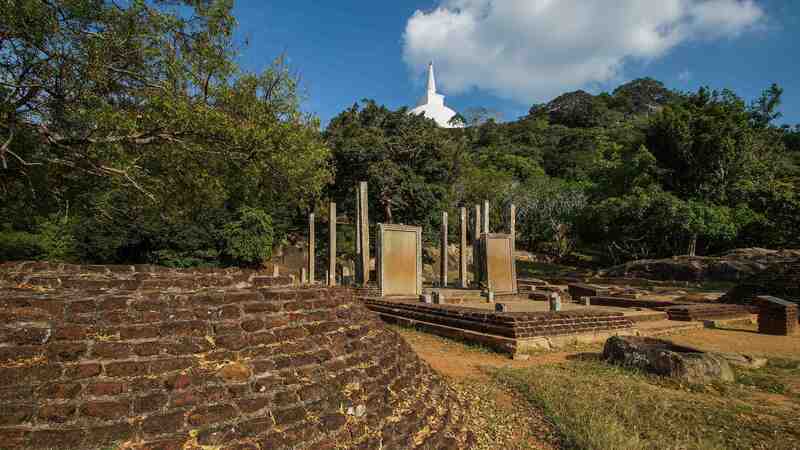 Rising up above the surrounding plains and the small village of Mihintale, is a hill which is definitely worth walking up both for the panoramic views from the top and for the chance to step into the mythic space where Buddhism first came to Sri Lanka. 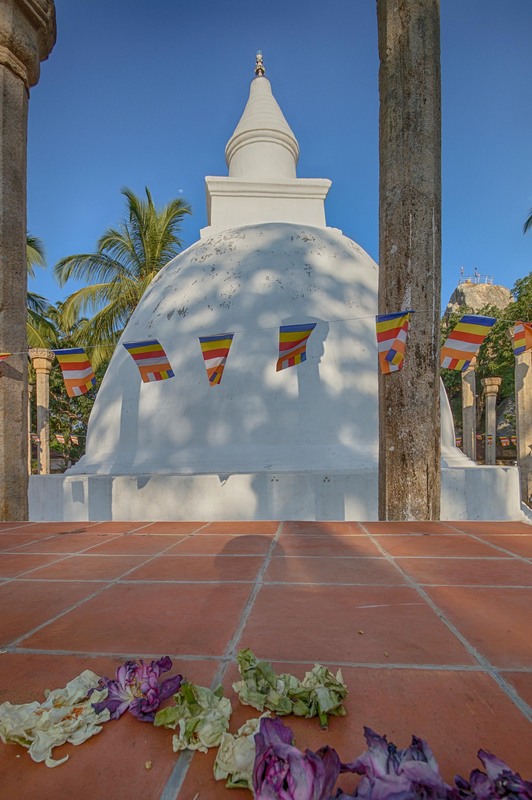 Mihintale was the dynamic site of a collection of Buddhist monasteries about two thousand years ago. 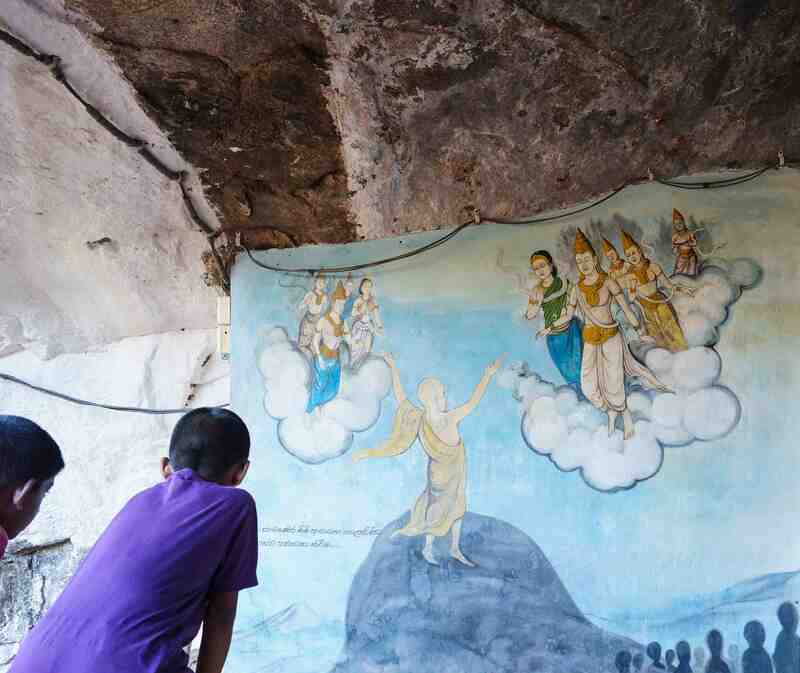 Its mix of ruins and living shrines continue to attract pilgrims and tourists alike. 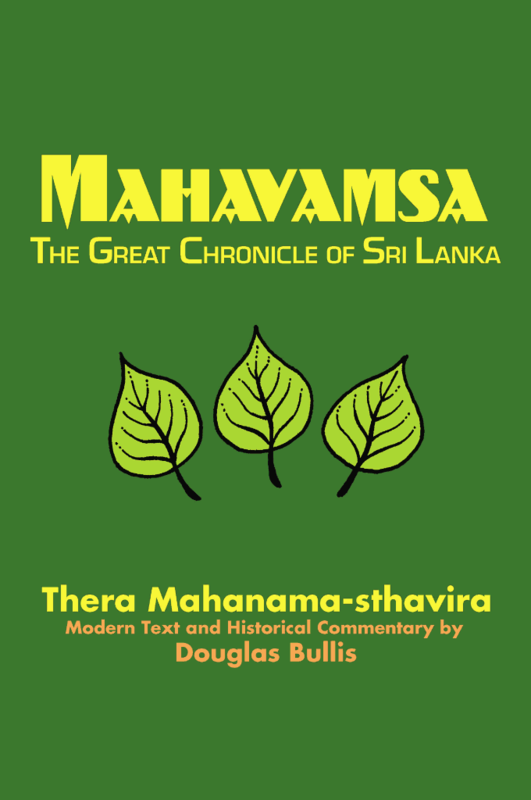 A more recent (1999) translation of the Mahavamsa is that of Douglas Bullis; the cover of his book is to the left. An excellent introduction and the first nine chapters complete with explanatory notes are available from the Google Books feature. It was an informative and totally worthwhile read. Click here if you want to while away a few hours reading the Bullis translation of the Mahavamsa. I couldn’t help but think of the great Roman epic, Virgil’s Aeneid as I read the first few chapters. Amazon has a used copy available for $70.! 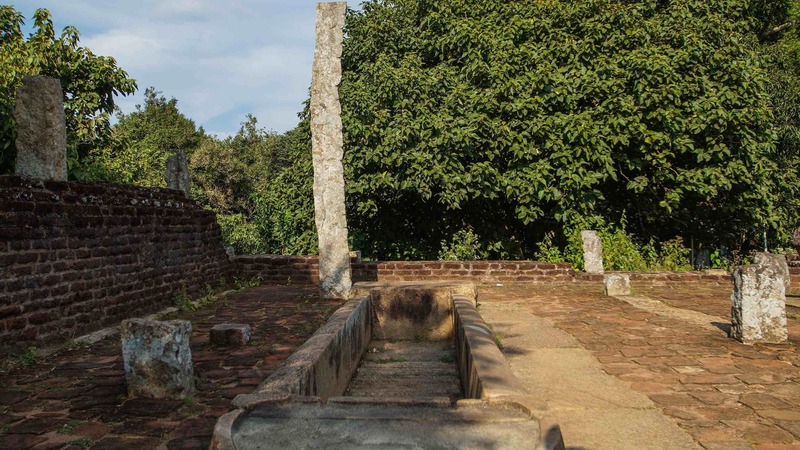 My most uncomfortable moment in Sri Lanka came when I asked my tour guide – a trilingual and well-educated Sinhalese forty-year old – whether many Sinhalese actually thought the story of the Buddha’s visits to be fact. Given his education, I had assumed he was “modern” when it came to the ancient stories. He was clearly shocked to hear me even question the historicity of the visits. It was one of those moments when I shut down my need to analyze and discuss and tried as gracefully as possible to talk my way backwards out of an argument I realized there was really no point in pursuing. The same thing would happen if I asked of one of the 50% (or whatever the percentage is) of Americans if they thought there is an actual figure named Satan active in the world. 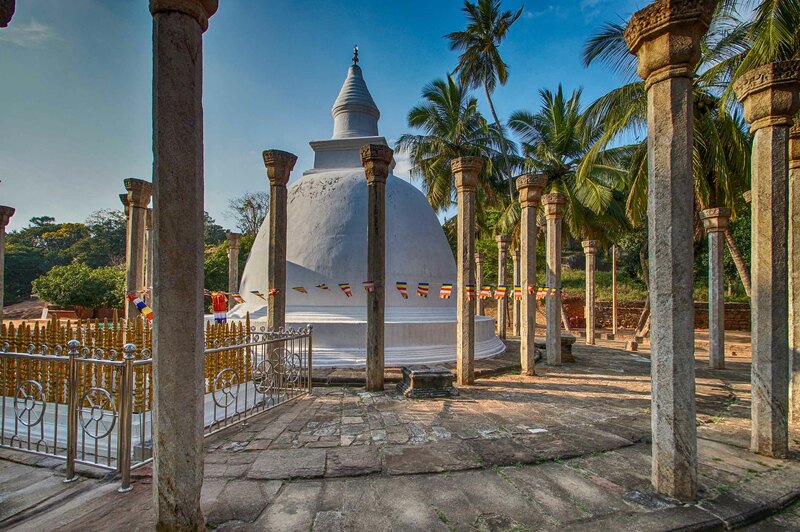 Another story in the early chapters of the Mahavamsa (Chapters XIII and XIV) develops another important thread in the foundation myth of at least the Sinhalese part of Sri Lanka’s people. 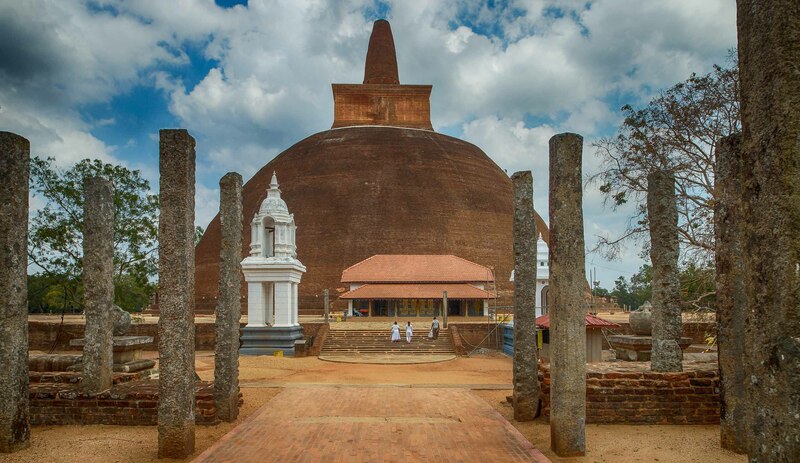 It makes clear that almost from the beginning Sri Lanka was chosen to be a place where Buddhism was meant to be. Not only did the Buddha (his usual dates are 560 B.C.E – 480 B.C.E.) 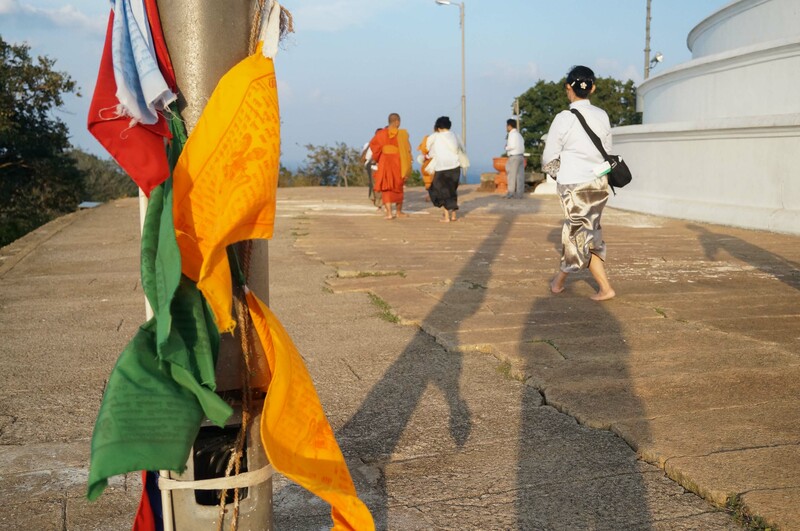 visit the island, but some two hundred years later a follower of the Buddha’s path arrived. It was the Buddhist monk Mahinda (Sanskrit – “Mahendra”). But he was not just any ordinary monk – he was said to be the son of Ashoka, who was the ruler of a great empire based in the north of India and a convert to Buddhism. 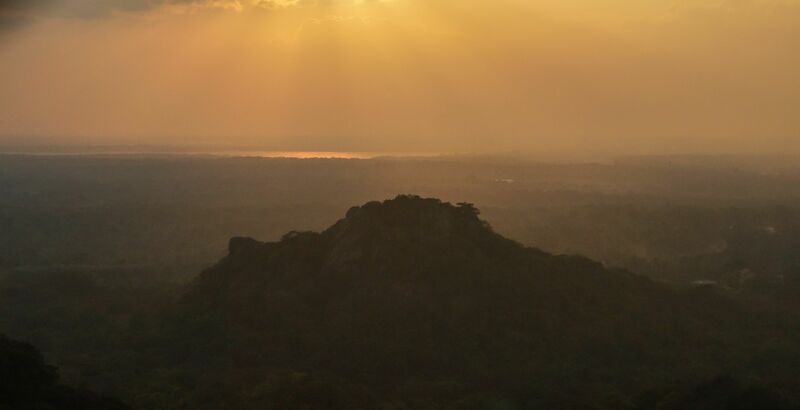 Mahinda and a few other monks came to Sri Lanka – again, neither by land nor by water – and at this site – Mahinda’s Hill – they met the Sinhalese ruler of the day who happened to be out hunting on this very hill. I arrived in Anuradhapura around noon on the 5:30 a.m. train from Colombo. 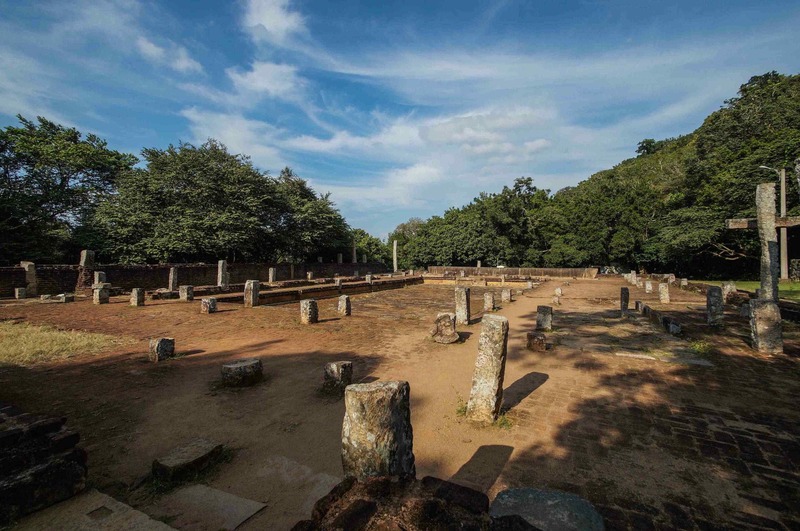 I had set aside the next two days for my visit to the ruins of old Anuradhapura, one of the great cities of the ancient world with thousands of resident Buddhist monks in three major monasteries and – next to the great pyramids of Giza – the largest man-made structure in the ancient world. I used the late afternoon of my arrival to visit Mihintale, having had the enterprising tuk tuk driver who drove me from the train station to my room at The French Garden Tourist Rest suggest that his auto rickshaw was available for a decent price. We left the hostel at 3:30 and by 4 were at the parking lot at Mihintale – but not at the very bottom of the 1800 + steps that you can choose to do if you do not want to miss a thing. My driver – his name was Mahinda! – took the old road which goes up to the middle terrace – right by the ruins of the Refectory (Almshouse) – so I’ll admit I did not get the full Mihintale experience even though I ended up walking about 1840 steps anyway! 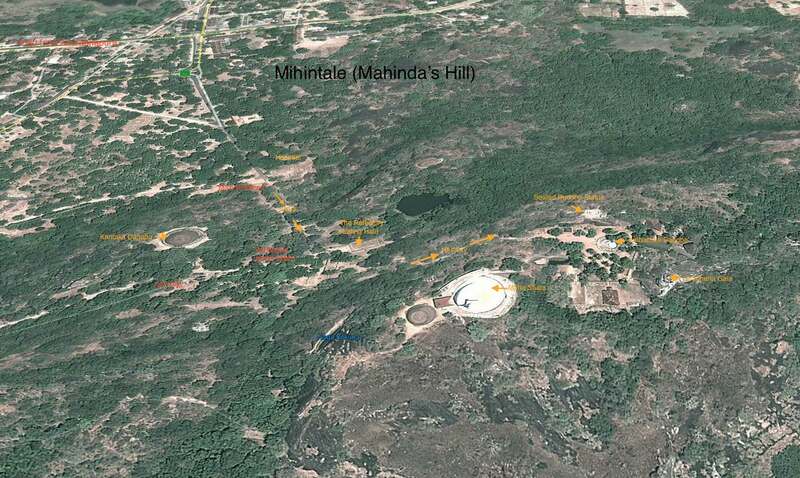 Below is a satellite view of the Mihintale site. Click here for an interactive Google map on which you can zoom in or out. Figuring that the next day or two would have lots of walking and ruins, I traded the chance to walk up the bottom half of the impressive set of stairs for more time up on the top, including a half hour chatting on the platform of the great dagoba with a group of Buddhists from Cambodia and then watching the sun go down in the company of local musicians as the pilgrims went off to see the statue of the seated Buddha below us. It was a good trade! Late afternoon is the sweet spot as far as visiting sites in Sri Lanka is concerned. 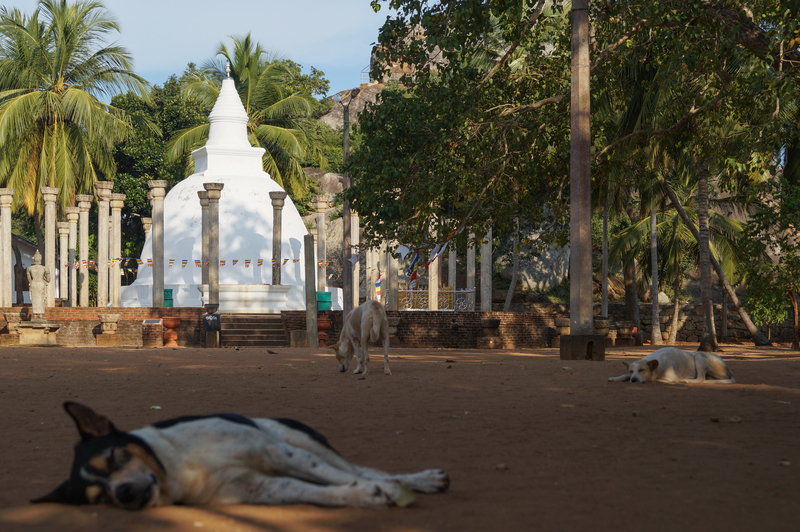 The school groups and tour buses have come and gone and so has the heat of mid-day; I spent about two and half leisurely hours at Mihintale. What follows is some of what caught my eye as I rambled around Mahinda’s Hill. Faxian text as translated by Herbert Giles. See here for source information. Two thousand monks! 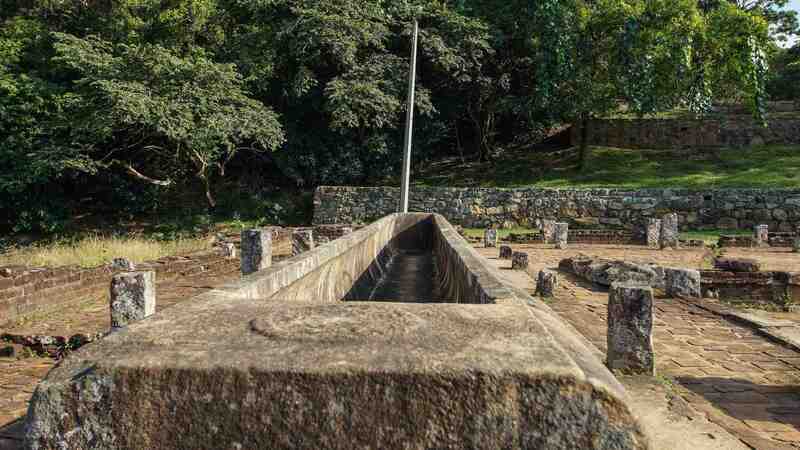 That would explain the size of the food troughs in the two images below – one filled with porridge and the other with rice on a daily basis by local people for the monks. Down the Great Stairway from this Alms Hall are the ruins of a hospital complete with a medicinal bath area carved out of stone. Given my entry at the middle terrace close to the Alms Hall, I did not see these lower parts of the site. The Hall itself was essentially a serving area; it was not large enough to provide for an eating area to match the size of the troughs and the eating area would have been elsewhere. Next to the Alms Hall and on the way to the staircase to the upper terrace you find the remains of the relic house as seen above. Walking up to the door, there are two stone tablets framing the doorway. The relic may have been something associated with Mahinda -perhaps a body part or a begging bowl or something he made use of in his life. 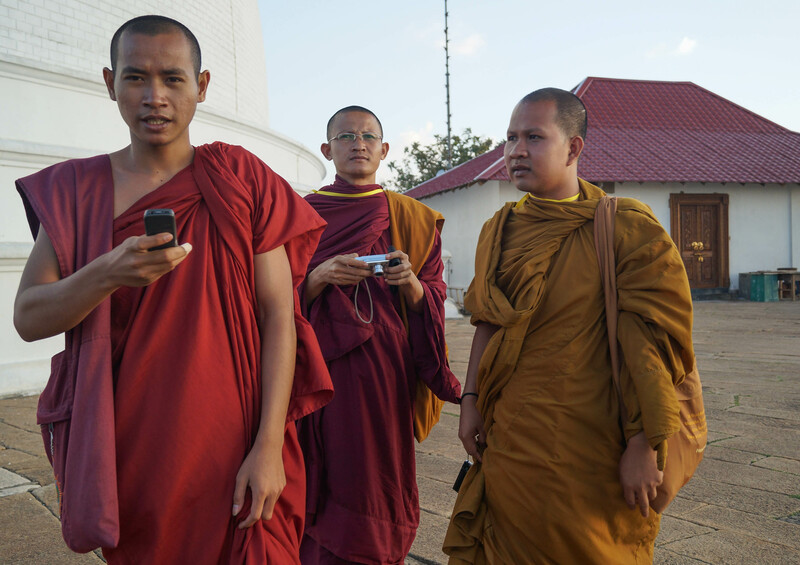 The text on the tablets deals with the rules and regulations which the monks who lived there were expected to follow. 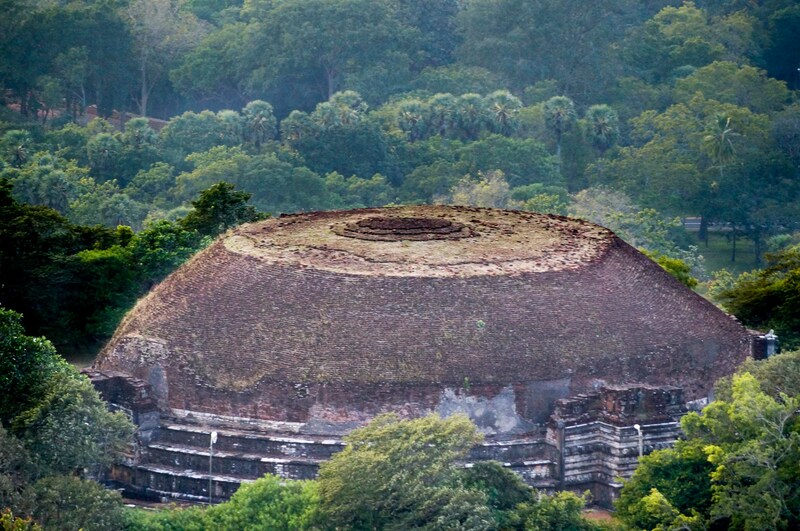 In the image below the top of the Ambasthala Dagoba is visible. And then it was time to deal with the steps to the main attractions at Mihintale – the Giant Seated Buddha, the Ambasthala Dagoba, the Aradhana Gala (“Invitation Rock”) and the Great Stupa (Mahaseya Stupa). 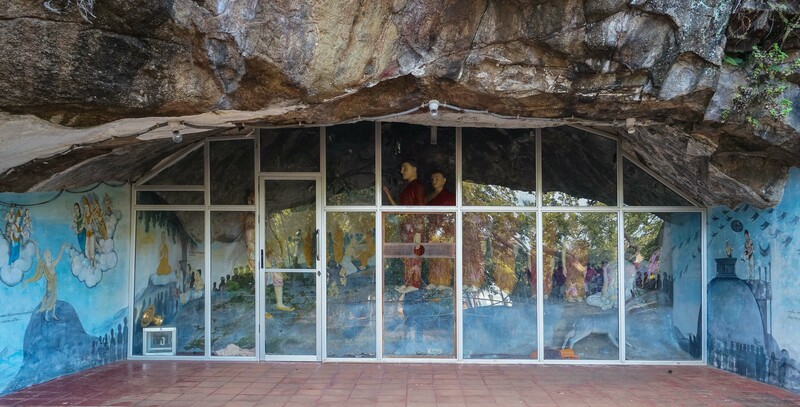 I should also mention the cave where it is said Mahinda lived for many years, but I didn’t find out about it until after my visit. Such are the perils of not making use of a tour guide! The steep Stairway to the upper terrace – I would get to know them well! While I avoided walking the first thousand steps up to the Alms Hall, the final set of steps (about 800) to the upper terrace were unavoidable! Up through the frangipani trees the staircase goes to the most interesting part of the site for visitors. First up is a ticket check and a request to take one’s shoes off. I asked why the guy with the gun (i.e.the uniformed soldier) was wearing his boots but the ticket boy could only shrug. For westerners not used to it, the hot sand on bare feet can be a painful experience! Some wear their socks. 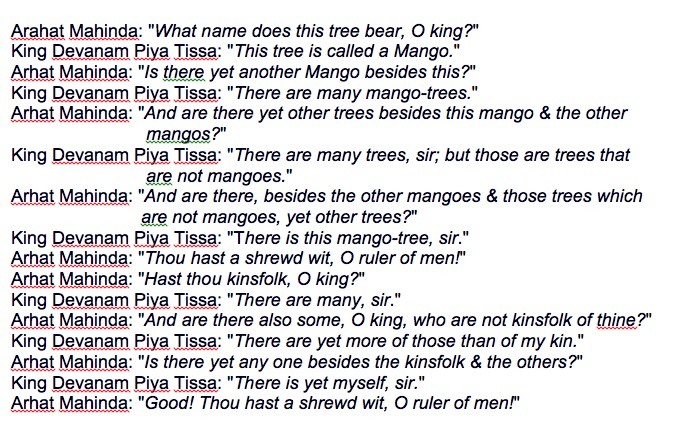 The Cryptic Conversation about Mangoes! 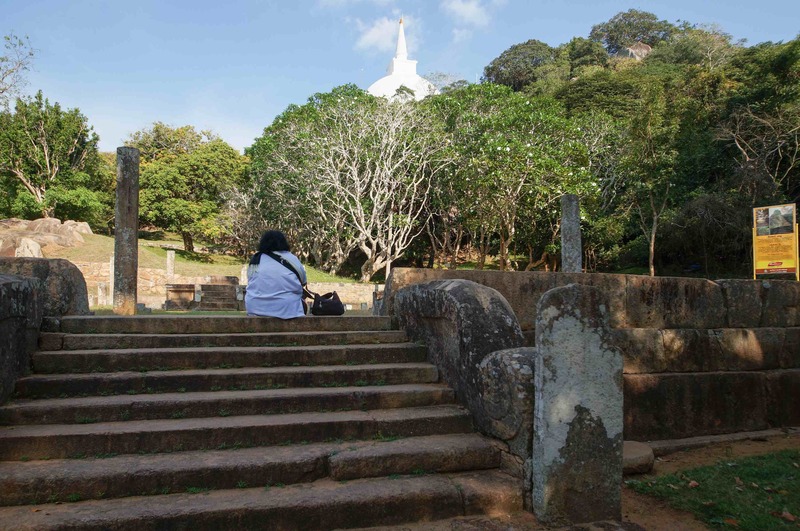 The small figure on the middle left of the above picture is a statue of the king; the dagoba sits on top of the place where Mahinda is said to have stood when they had this cryptic conversation. 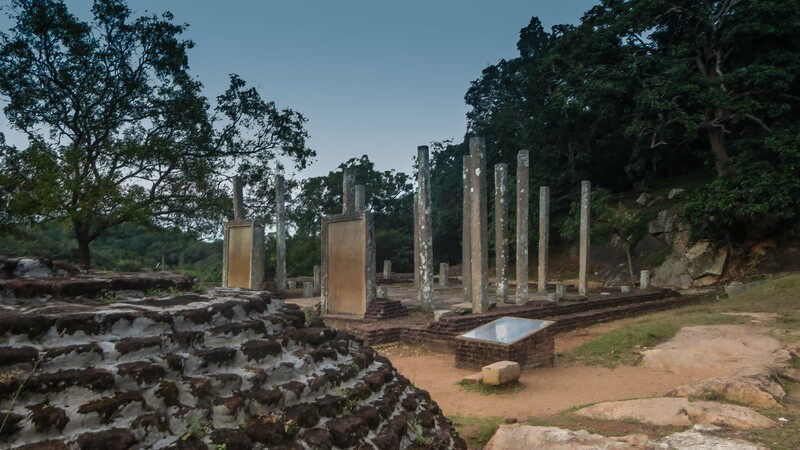 As with dagobas at Anuradhapura and Polonnaruwa, all that visitors now see is a mini-forest of pillars in various degrees of uprightness when they walk around Mihintale’s Ambasthala Dagoba. 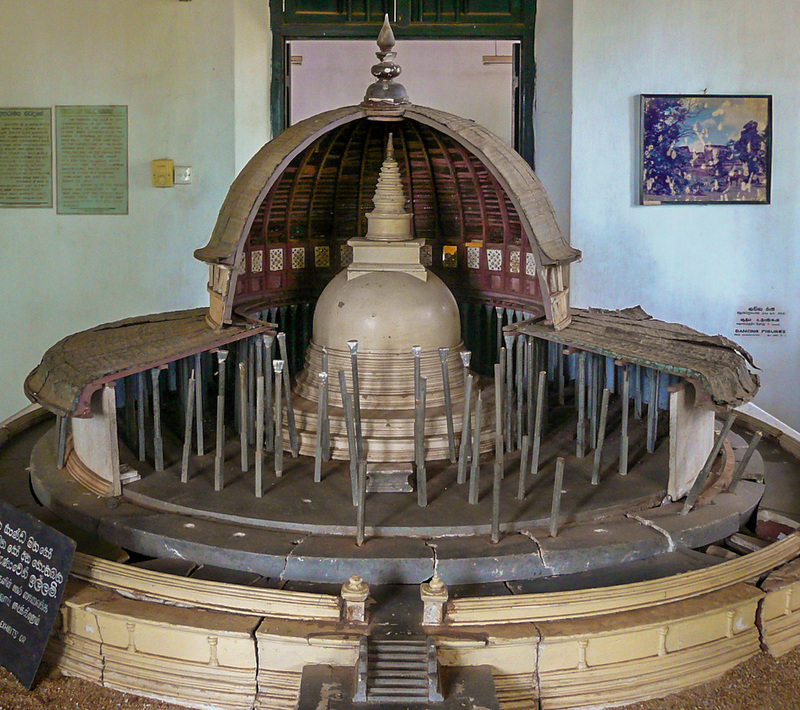 inside the railing is a stone version of the Buddha’s footprint, another key element of Buddhist worship in Sri Lanka. These 1.5 meter footprints can be found at Sri Pada (Adam’s Peak) and elsewhere. Pilgrims will often toss coins into the enclosure when they visit. 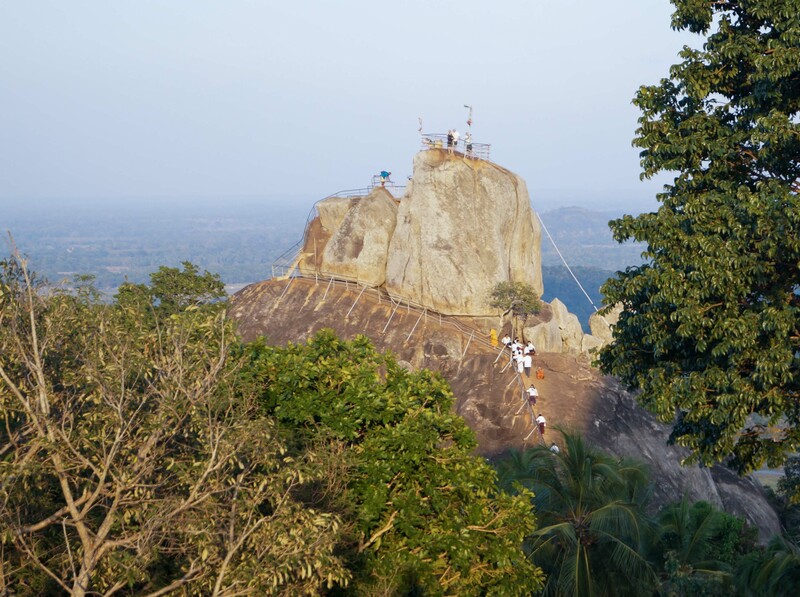 Not far the dagoba and the pillars is the beginning of the climb to the top of Aradhana Gala (literally Invitation Rock), where Mahinda apparently delivered his first teaching of Buddhist doctrine and invited the king to embrace the true path. The giant seated Buddha figure in the Abhaya Mudra hand pose The open palm signifies safety and reassurance that all is well. “Have no fear,” it says to the pilgrim. See here for more info. 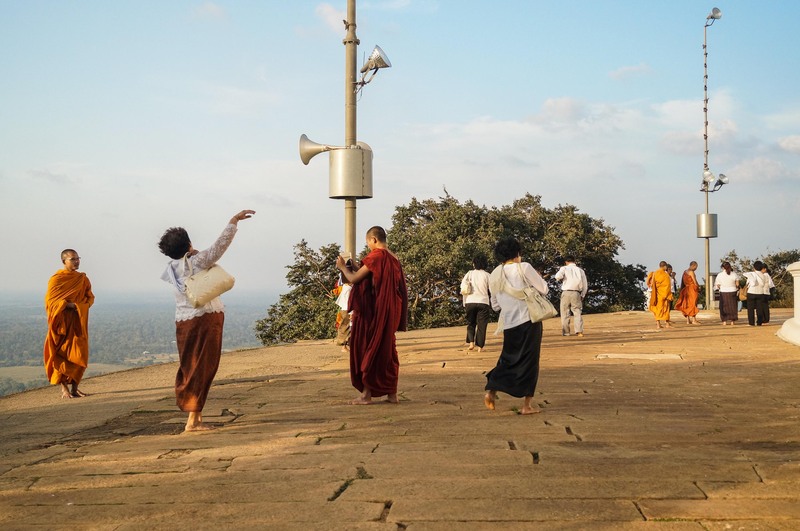 On the platform surrounding the Mahaseya Stupa I met a group of pilgrims from Cambodia led by the monks above. We chatted while we circumambulated the stupa; unfortunately, I was a little late getting up there so could only watch as they closed the door of the temple built onto the south side of the stupa. 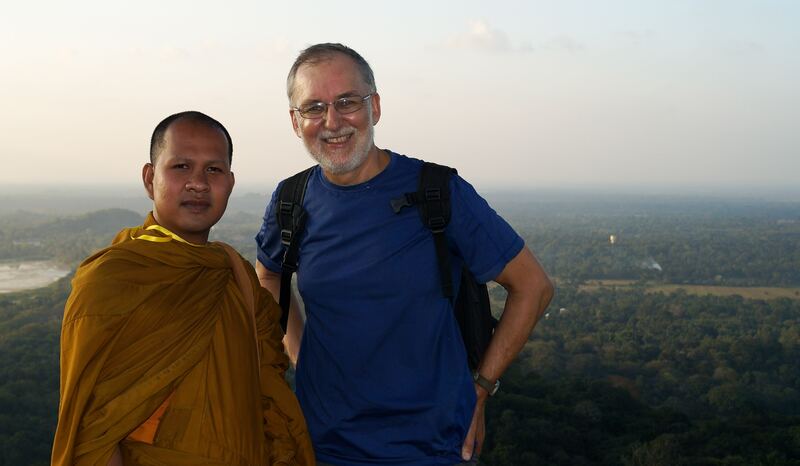 When they went off to the Aradhana Gala, I stayed up on the Stupa platform and waited for the sun to set. I was soon joined by a three local musicians whose drum and flute work reminded me of the music I had heard at a Kandy dance performance a few days earlier. While their music added to the atmosphere of being there, I am sure they were somewhat disappointed not to find a larger tour group of visitors. 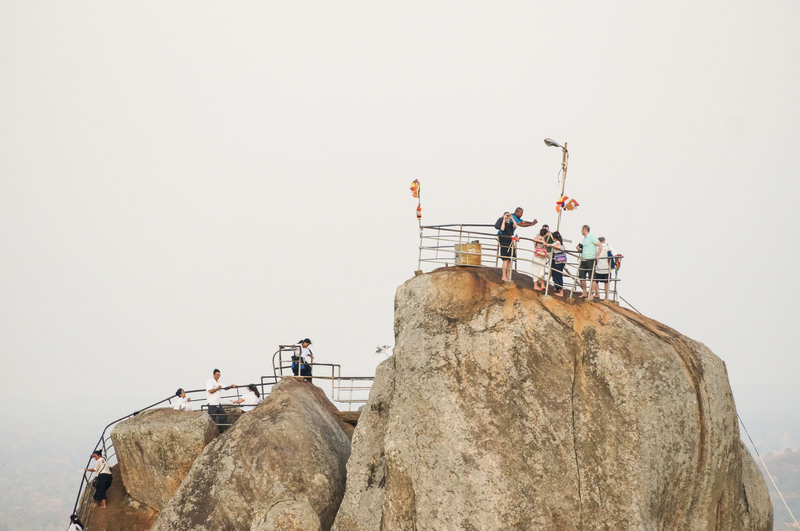 As I looked across from the Stupa to the Aradhana Gala I could see a few tourists up on the rock. From the other side of the stupa I looked down to an area near where my tuk tuk driver was waiting. What is left of the Kantaka Dagoba, the oldest of the dagobas at Mihintale, is now about twelve meters high, about half of the original height. Had I gone up to the dagoba some of the fine detail, as well as the stone altars and sculptures, would have caught my eye. As it was, when I got back down to the parking lot, after walking down the staircase, I realized that I was standing there without my shoes. I had left them at the top of the stairs! Mahinda offered to go up and get them but I had to decline his offer. “My bad!” I told him! We had taken the road up the hill to eliminate about half of the steps. Somehow, it was fitting that I ended up walking the 1840 steps anyway thanks to my forgetfulness! 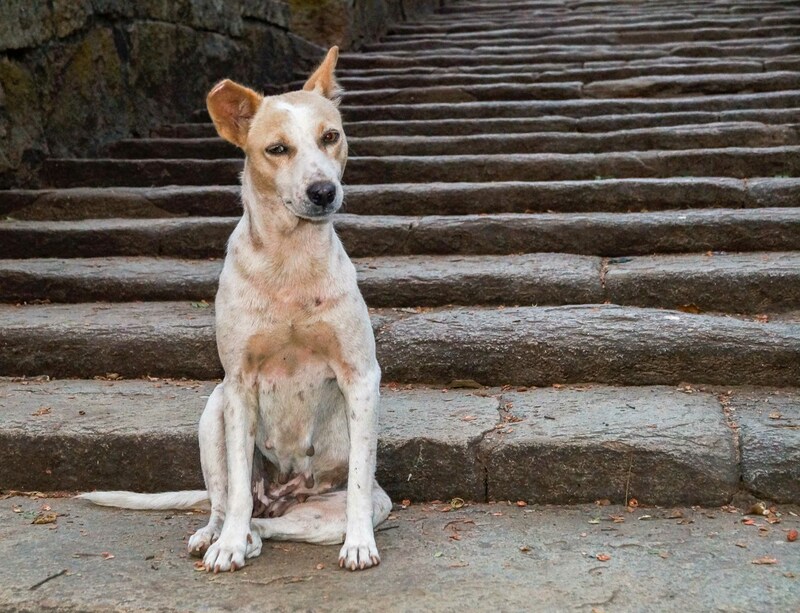 On my way back up I passed this dog – a knowing bodhisattva in disguise. The two and half hours I spent visiting Mihintale were well worth it. The late afternoon shade and the relative absence of other visitors made the visit that much more enjoyable. 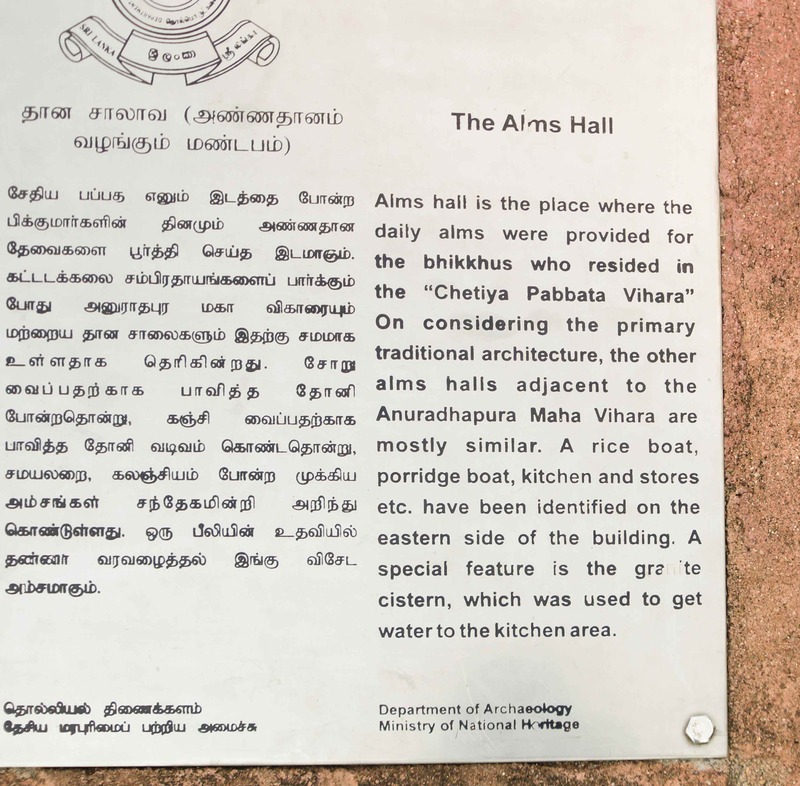 More time – and a map of the site or a guide – and I would have seen a bit more of Mihintales has to offer. 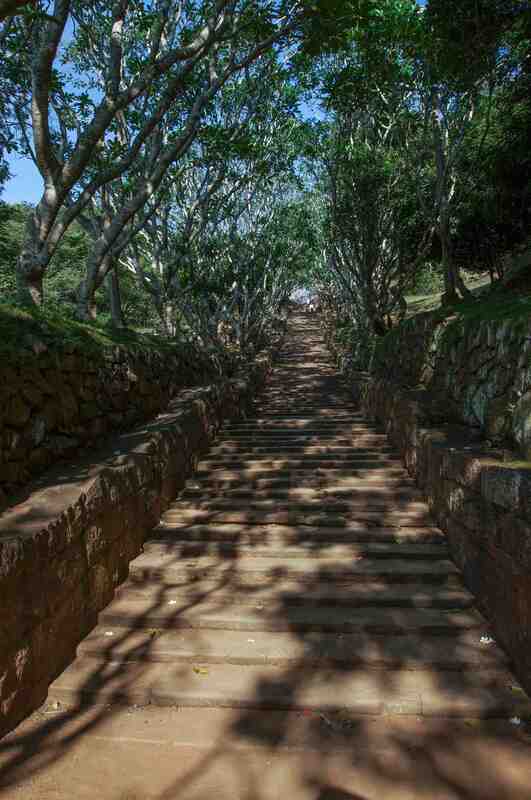 In particular, I would have made my way to Mahinda’s cave and up close to the Kantaka Dagoba. A half hour auto-rickshaw ride and I was back in Anuradhapura. My next day would fill me up with the ruins and dagobas in the old part of this city, one of the great cities of the ancient world. Click on the link below for a post on what there is to see. It would make for a fantastic combination with my afternoon at Mihintale. 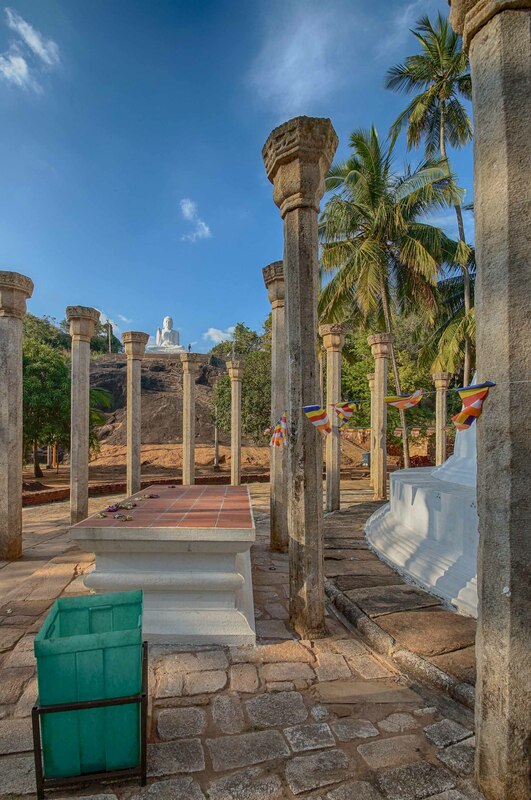 This entry was posted in Sri Lanka and tagged Ambasthala Dagoba Mihintale, Aradhana Gala Mihintale, cultural triangle, Giant Seated Buddha Mihintale, mahavamsa mahinda, mango tree riddle Mahinda, mihintale cultural triangle, mihintale Fa Hsien, Mihintale Maha Dagoba Stupa, mihintale mahinda, Mihintale Relic House, mihintale staircase, vatadage Mihintale. Bookmark the permalink.